The sheer range of data you can get, neatly balanced with enough smartwatch connectivity, set in the context of so much potential through the compatible sensors and accessories makes it hard not to recommend the Garmin Forerunner 935. At this level, there are very few who can compete. The top-end Garmin Forerunner model has always been something of a chunky monkey, stretching all the way back to the heady days of the Forerunner 101 in 2003. It wasn't until 2013 with the Forerunner 220 that things really started to feel slimline, but even then the 2014 Forerunner 920XT was a pretty big flagship device. This leads us to the Forerunner 935 - which effectively replaces the 920XT at the top of the Forerunner line and, although it drops the XT branding, is still a fully-featured multi-sport device. What's perhaps most impressive is that the 920XT sat at the top for the best part of three years; Garmin devices do last a long time and support for them lasts a long time too. That's something to consider if you're eyeing up a watch such as the 935 - which costs over £400. Is it worth it for your fitness tracking? That's the perfect precis to lead into talking about the Forerunner 935's design, as compared to other Forerunner products that's where the biggest shift is for this device. The influence of the parallel Fenix family can be clearly seen here, as the 935 is more like a watch and less like the blob that the 920XT was. It's also clearly related to the 735XT and lower rungs of Forerunner devices - although the quality of the 935 looks and feels a little higher. It's an inherently wearable watch, as Garmin (and the industry, really) has moved from focusing on tracking your sports performance to monitoring your whole day, the 935 is something we've been happy to wear all the time. You couldn't say that about its predecessor. The Forerunner 935 has a plastic body, which is one area where it differs from the Fenix 5, which uses materials like stainless steel to enhance the protection further. The 935 is waterproof to 5 ATM, so it's going to be happy with your water sports and is packed with swimming functions as a result. There's a 22mm silicone band, so you can choose to switch bands if you want, otherwise the watch comes with a black body and black strap. The QuickFit bands cost £45 if you want to switch them out. If you opt for the tri-bundle version that comes with the HRM-Tri and HRM-Swim monitors, plus you'll get a yellow watch band. These silicone bands are nice and comfortable, using a conventional buckle which is really easy to adjust. There's enough flex in the band to let it stretch a little to remain comfortable in prolonged usage. Like other Forerunner devices, the 935 has buttons to the left and right of the body - and no touchscreen. We like this arrangement because it's easier to manage using button presses, rather than vague swipes while you're trying to run along a perilous off-road track. These buttons are metal too, so there's a premium feel in use. Overall we like the design. It's an obvious enhancement over the closest model in the range - the Forerunner 735XT - but is pretty big, so those of smaller stature might find it a little on the large side. Cutting to the real details, it's hardware that really separates one Garmin device from the next. And the range of hardware dictates the functions supported by that device. The Forerunner 935 essentially does almost everything that Garmin offers - the only features its missing are Garmin Pay and offline music support, which the new Forerunner 645 Music offers. GPS and wrist-based heart-rate monitoring (as well as compatibility with Garmin chest straps if you prefer) provide the basics for activity tracking, but with those extra sensors giving you a lot more data. Compared to the 735XT, it's the addition of the barometric altimeter, gyroscope and thermometer that offers more hardware features. Of these it's the altimeter that probably gives you the more interesting data, because it's that which enables 3D distance and speed, accurate changes in elevation and on the day-to-day tracking a measure of stairs climbed (if you care about that). For cyclists or those into mountain sports, elevation change becomes all the more useful than those just running on the flat. You have the option to turn 3D distance on or off, depending on your preferences. There's also Wi-Fi in this watch which will allow it to sync to Garmin Connect (the associated platform and app, where you data can be stored and tracked in friendly visual form) through a friendly Wi-Fi network without a phone - although we suspect many will be happy with the direct Bluetooth connection to their device. In addition to the sensors built into the watch, there's also full support for external sensors. We've mentioned heart-rate chest straps and we paired the 935 with an old strap (one from a Forerunner 610) for use on the bike, as well as a Garmin cadence/speed sensor (we're not sure where this sensor came from - it's been sitting in a bike spares box for years, but it had no problem feeding in this data). This is an inherent advantage of the Garmin ecosystem. Being able to use existing sensors you might have, or the option to buy new sensors as your needs change, makes the Forerunner exceptionally flexible - although that's not only limited to this 935 model. With all this data, it's really the packaging, processing and presentation that defines the feature set. Firstly, you have support for a huge range of sports, cutting across the common one - running, swimming, cycling - through the combinations - triathlon, duathlon, brick - and into the more obscure - parachuting (HAHO, HALO and static line); a nod to Garmin's popularity with military types - all being supported. There's even a tactical mode, giving you long/lat coordinates and route-tracking in your normal collection of screens. We're guessing that if you're not going tactical you might find it rather useful for orienteering. There's full support for golf too, with digital scorecards, yardage and full stat tracking, as well as TruSwing compatibility (Garmin's golf sensor accessory). We didn't test the golfing functions, but this is another area that sets the 935 aside from some other Forerunners - remembering that Garmin has the Approach devices also dedicated to golf. There's full 24/7 activity tracking, monitoring resting and active heart rate throughout the day, your steps and even sleep. Ad hoc activities that you might not specifically record are monitored too, thanks to Move IQ - which automatically detects the type of activity, so when you look at a summary of your day, you can see what you were doing, whether riding your bike to the station or walking with the dog. This feature isn't fool proof: Move IQ told us we had a mid-afternoon swim, which we certainly didn't. Beyond all this, the real charm of the Forerunner 935 is in the metrics it will provide on performance and your training status, making it a tool for many, with loads of information on offer. Providing the time, speed and distance of your run is now a little basic, with many devices looking to give you more. For the Forerunner 935, running is the best served activity in our opinion, with some features like training status needing you to be running to return results - sorry cyclists. When on a run the Garmin Forerunner 935 is accurate in returning heart rate and GPS data, matching the route we would run and within the expected heart-rate ranges. It also corroborated with our manual pulse testing. The option to use a chest strap is welcomed and something we often choose to do on the bike. Using a heart-rate strap is also necessary to unlock the heart rate variability function, designed to measure your stress levels - which works well enough as an additional measure of your general wellbeing. Maybe you do need that holiday to Club La Santa to decompress. This gives you an insight into how accurate Garmin considers the Elevate wrist-based HR monitor to be, because it insists you use a chest strap for this more accurate measurement process. For 99 per cent of athletes, wrist-based heart-rate tracking with zone guidance is likely to be accurate enough and, let's face it, it's a lot less fussy than using a chest strap. For heart-rate tracking when swimming you'll need the HRM-Swim or HRM-Tri straps. You can buy them in a bundle with the 935, or buy them separately for £79 or £99 respectively. Heart rate is quickly detected through the watch's sensors and GPS is quick to lock on, even when used in a new location. With older Garmin devices we've often had to wait some time - for the old Forerunner 610 we'd have to put it in sight of the sky for about five minutes to get it to connect. The 935 is so swift that it's a joy to use. Other sensors are quick to pair and quick to detect, so there's no wasted time trying to get the technology to work. The combination of GPS and compass means there's full support for breadcrumb trails or following your route back to your starting point. It's nice that you don't have to set out with this in mind, you can just pause your workout and you're then presented with the option to return to where you started. The Garmin Forerunner 935 doesn't do full mapping like the Garmin Epix but it does do full course navigation, with support for GPX files to download popular routes. You can also create routes through the Garmin Connect website really easily and send them to your watch, with a directional indicator appearing on your information screens during that activity. Course creation is really good (including elevation and the option to add average speed information so you know how long it will take), so well worth it for those heading out on long rides or runs - and if you're the sort of person who wants to cycle a route that draws a funny/rude picture, then this is how to do it. This is all calculated from your stats and set against baseline data (we're assuming), so for those with particular training aims and programmes - like to get a sub-3hr marathon or 14hr Ironman - this might be irrelevant, but it will use the data gathered to tell you the effect that training session will have. That might be threshold improvements or endurance gains. It's a little like the information you can also get through Polar Flow - and if you're a casual exerciser rather than training for a specific event or race, it can be a useful measure to know that you're improving your overall fitness. We also like the recovery measure, which tells you it will take, say, 56 hours to get over that epic ride you put in. Again, it's data drawn from averages and won't suit those who are really fit, but it's a good general guide and a reminder that rest days are a hugely important part of any structured training programme. You can also measure/estimate lactate threshold and VO2 Max without the need for a sports science lab. These performance measures are garnered from data the watch is being collected anyway - and even if they aren't spot on (they're algorithmically calculated from averages), you can at least aim to improve those scores and use that as a measure of your increasing fitness. There's also a measure for power to weight ratio, which is where you'll see the downside of carrying a few extra pounds. There's support for intervals and other workout types, including complete training programmes that you can collect from Garmin Connect, scheduling the date you want to start (or finish), which are added to your Connect calendar so you can sync to your watch. From these you'll know what you're supposed to be doing each and every day. The inclusion of snow sports adds another dimension for the serious or occasional skier or snowboarder, and adding skiing to the specific activities offered takes a few button presses, so you can add it for your annual ski trip for example. Here you get big displays for speed and elevation, with automatic tracking of runs. If you stop the clock doesn't keep running, so at the end of the run you have an accurate record of the actual time you spent moving, rather than the time you stopped to take pictures, pick yourself out of the powder or whatever else. The biggest failing of so-called smart watches is battery life. Take the Apple Watch for example: if you get two days from it, you've done well. Let's just say that the Forerunner 935 laughs in the face of any of the smart watches out there, easily surpassing the endurance of anything from Apple or Android/Wear OS. Sure, the display is very different and there's nothing like the level of app compatibility that you'll find on those smarter devices, but on average the Forerunner 935 will last you about a fortnight. This will vary depending on your tracking, as running the GPS and HRM features will deplete the battery faster, of course. However, it is still good for 24 hours of continuous tracking, so will see you through an Ironman, which some other devices simply won't. There is also an UltraTrac mode that will extend to 50-60 hours. It's less accurate, taking fewer measurements, but that will get you to the end of a multi-day event and still give you results. The charging of the Forerunner 935 is via Garmin's newer plug-in type charger, which connects to the back of the watch. We much prefer this to the crocodile clip (or magnetic) chargers of previous devices as it stays in place and is fuss free. With so much offered, it's easy to see how features can get lost on a watch. In the 935 there's been some work to enhance the user interface over the Forerunner 735XT: it's a little more logically laid out and thus makes for a smoother experience, combined with a higher-resolution display to look better. Everything on the 935 is customisable, from the screens you'll get during activities to the amount of data they contain. If you want to change the fields that's easy, plus you can make changes during activities too. Outside of sports activities, you can change the screens you're presented in watch mode, with plenty of options here too. Thanks to smartphone connectivity (and not just for syncing data), you can have your calendar, notifications, music controls and a whole lot more presented on the watch. You can download and create custom watch faces too. For those who like to use Strava the integration with Garmin Connect is great. There's even the option to have Strava Suffer Score as a screen. There's the option to LiveTrack, where you can send a link to friends/loved ones/your social network, so that others can track your route and performance. This isn't just where you are, but you'll get other details in there like your heart rate. This requires a phone in tow, however, so it's less appealing to runners - but if you're out on a long ride, then it's really handy for anyone wondering when you might get home. In many ways, the Forerunner 935 does as much as many smartwatches. While it won't give you the same app support, it does cover the essentials, without the terrible battery life that smartwatches suffer with. Garmin Connect Mobile manages the experience on your smartphone, with seamless syncing into the app and away into the cloud. We've mentioned Garmin Connect a lot already, but it's the app where you can really browse your stats, check how active you've been, see what workouts you've got scheduled or examine things like your heart rate data in more detail. Garmin Connect is the same app for all users, whether you've got a Vivofit activity band or an Edge bike computer. The presentation has become more lifestyle in recent years to fend off the likes of Fitbit and their march into fitness. In the current version it's actually very useful and importantly the syncing is fast and the connection stable. This has been something of a barrier for TomTom and Suunto - so Garmin certainly feels one step ahead here. However, it's worth noting that Garmin Connect Mobile needs to sync to the cloud to get some data, so if you don't have a good connection to the outside world then the syncing experience is greatly deteriorated. About the only negative of the Forerunner 935 is that it doesn't support native music, it only offers control over music on your phone. That's a disadvantage compared to devices like the TomTom Adventurer or the Apple Watch 3, both of which will let you take your music on the run, listening to Bluetooth headphones without the need for a phone. Garmin has addressed this with the new Forerunner 645 Music and we suspect the 935's ultimate replacement will add these features. The Garmin Forerunner 935 also doesn't support Garmin Pay. Garmin is an old master in this sports watch arena, with a portfolio that's stuffed with compelling devices. The Forerunner 935 is certainly accomplished, not only with the vast range of features it offers, but how it all hangs together. It feels and wears better than the lower-level Forerunner devices, although it's not quite the luxury that the Fenix 5 is. The question for anyone looking to buy into the Garmin system - and, as we've said, it's a vast system - is how much do you really need from your watch? 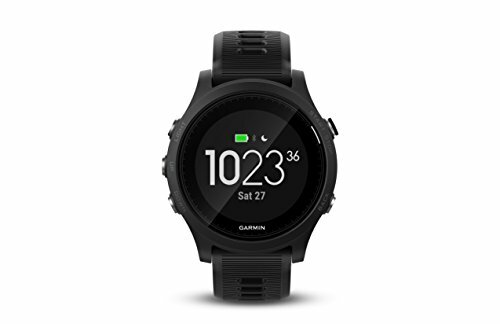 For the multi-sport athlete, the Garmin Forerunner 935 is an absolute joy and unlike some of the company's previous devices, this is a watch that you might just want to wear every day, which might help make the case. For those who only want a running watch, we'd be doing you a disservice if we didn't recommend looking at the range of features that might better suit your budget in other Forerunner devices like the 735XT or the 235. But the sheer range of data you can get, neatly balanced with enough smartwatch connectivity, set in the context of so much potential through the compatible sensors and accessories, makes it impossible not to recommend the Garmin Forerunner 935. At this level, there are very few others who can compete. Sitting very close in function to the Forerunner 935 is the Fenix 5. This is billed as the ultimate outdoor watch, encompassing slightly more protection with 10 ATM, while also adding premium materials like a stainless steel bezel - or titanium if you're feeling really flush. In use these watches are very much the same, but the Fenix 5 does have a more premium look, if you want to pair it with your suit and tie, rather than just your sports wear. Garmin's biggest rival for many years has been Polar. While Garmin is synonymous with GPS, Polar is synonymous with heart rate tracking. The V800 is Polar's most advanced watch but it is several years old now. In many ways, Garmin has moved to better compete with Polar Flow, which this device offers, giving you details of things like your training benefit and status, along with all the tracking and sports profiles you could want. The ecosystem isn't quite as wide as Garmin's and we can't help feeling that Polar's flagship is due an update. The TomTom Adventurer doesn't offer anything like the ecosystem you'll get from Garmin, nor does it offer as many options for tracking sports or the metrics it will offer you. However, it is half the price of the Forerunner 935, offers accurate GPS and heart rate and also offers an altimeter and digital compass, so will do many of the same things, like breadcrumb route tracking and 3D distance. It's a nice device and has the option for onboard music too via Bluetooth headphones - so you don't need your phone.